Margaret Walther, Robert Hopkins, Carol Taplin, Fran Johnson, April Silvani, Caitlin Read and Bob Rescigno on April 27; Pat Binder, Chelsea Phillips, Jordan Knight, Charlotte Moore, Lisa Julian and Chris Clark on April 28; Ronnie Tybaert Jr. and Nicholas R. Bittner on April 29; Harrison Weslek, Richie Halsey, Drew Conroy, Cara Cass and Kim Cannon on April 30; Teri Piccozzi, Sara Jane Verwymeren and Claudia Carucci on May 1; Anne Quimby, Michael Santillo, Jennifer Yeager and Ashley Knight on May 2; and Janet Jernick, Jim Wallace, Emily Parsons, Tanya Schmid, Fred Patykeich, Lacey Faulkner and Richard Russ on May 3. JoAnn and Mike DeMarsico Jr. on April 27; Teri and Angelo Piccozzi on April 29; and Thomas and Jennie Farraher on May 1. 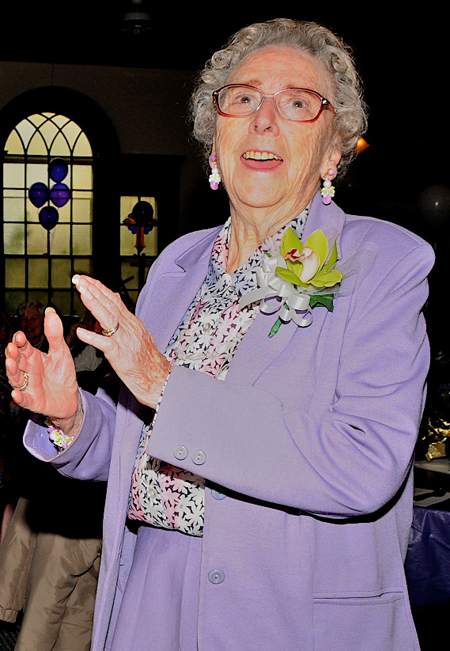 Rosemary Griffing, who celebrated her 90th birthday at a party given by family and friends at the Presbyterian Church late last month. Gayle Gurney, Paul Juzapavicus, Robert Francis Juzapavicus, James Patton Bisher and Kevin Lechmanski on April 20; Melanie LoBue, Rachel Doman and Louise Oliver on April 21; Paul Speeches, Colette Roe, Lenora McClean, Tim Fitzpatrick, McKenna Cangemi and Grace Kempton on April 22; Roger Sherman, Tscharner Brian Thomson, Luca Pfitzer, Len Kotler, Mason Marcello, Charlie Hoffmann and Gerald Boyle on April 23; Erinn Eschler, Elizabeth DiPaola and Joshua Tudor on April 24; JoAnn LoBue, Billy Ryan, Caroline Wheeler Clark and Nell Lowell on April 25; and Andrew Allen Ogar and Kathleen Marshall on April 26. Pat and Dave McGayhey on April 23; Capt. William and Janet Hansen and Lillian and Bob King on April 24; and Gayle and Ric Gurney on April 25. Christopher Ames, Patricia Repka, Bernice Melcer, Glenn Kushner and Bonnie May Young on March 16; Donna Chicka, Gregg Petry and Shane Corbett on March 17; Brian Gershon, Art Bloom, Delaney Campbell, Laurie Williams and Claudia Gray on March 18; Laura Wright Ford and Leonardo Lamar Dougherty on March 19; Gary Reeves, Amy Zavatto, Nanette Bloom, Nolan James McLaughlin, Angelo Piccozzi and Riley Willumsen on March 20; Janet Zavatto, Jennifer Madden, Margaret Walsh, Kyle, Joshua Escobar and Camryn Page on March 21; and Barbara Lenox and Marion Juzapavicus on March 22. Vincent and Lauretta King on March 20 and Robin and David Ryan on March 21. The deadline is fast approaching for additions, deletions and changes to the Shelter Island Reporter’s 2012-2013 telephone book — mid-April will be here before you know it. Please have a look at your listing and let Archer know if you want anything added or taken out. Call her at 749-1000, extension 26, or email her at [email protected] And if you want to add a listing — never a charge — let her know that too. A fundraising party will be held on Saturday, March 17 from 3 to 6 p.m. at Hanff’s Boatyard on Sterling Street in Greenport to support Shelter Island sailor Amanda Clark and her teammate Sarah Lihan in their competition for a 2012 Olympic medal in Weymouth, England this August. The women — Team Go Sail — are currently ranked sixth in the world by the International Sailing Federation. Local beer and wine will be served and food prepared by Chef Dan Mannix. Three sailing charters will be auctioned off and both Amanda and Sarah will be on hand to answer questions and display their international 470 racing boat. Tax deductible contributions of $100 may be made at the door, all credit cards accepted. Those unable to attend but who would like to contribute may call Amanda’s husband, Greg Nissen, at 749-5444. Penny and John Kerr on March 11; and Michael and Dede Gray on March 14. Jeff Simes didn’t get his Reporter and see Flashback until after we went to press a couple of weeks ago but he knew the three Little League All Stars, his son Craig being one of them. Craig is now 35, living in Lithia, Florida with his wife and three kids — Luke, Megan and Wyatt. He works for a truck leasing business, his dad said. Steven Kraus, Richard Rush, Janet Loconsolo D’Auria, George Serban, Luke Rosato and Libby Liszanckie on March 2; Michael Shlala, Dirk Willumsen and Christano Gonzales on March 3; Rich Lomuscio, Sheila Harrington, Suellyn Preston, Louis Evangelista, Patricia Evangelista and Archer Brown on March 4; Laurie Clark Morin, Jill Taplin, John Patrick Goodleaf, Nancy Hamilton and JoAnn DeMarsico on March 5; Abigail Bisher, Lachlan McFarland and Emma Teodoru on March 6; Joan Young, Beverlea Walz, Linda Eklund and Billy Banks on March 7; and Hap Bowditch Jr., Joe Klenawicus Jr., Hans Schmid, Jamie Harrison, Justin Schlesinger-Devlin and Savannah Sherman on March 8. Donny and Nancy Walther on March 7. Katherine Goldsmith, who has been accepted at Wellesley College. A National Merit Finalist and a premier soccer goalkeeper, she will graduate from Greenwich Academy this spring. Katherine is the daughter of Jessica and James Goldsmith of Armonk, New York and the granddaughter of Islander Carol Galligan.